As he rushed to complete his “great work,” The Birds of America, Audubon purchased many skins and, in order to meet his deadline, illustrated more than one species on a single sheet. During the winter of 1836 in Charleston, he painted these related members of the titmouse family, a male and female of each species, in a charming scene. 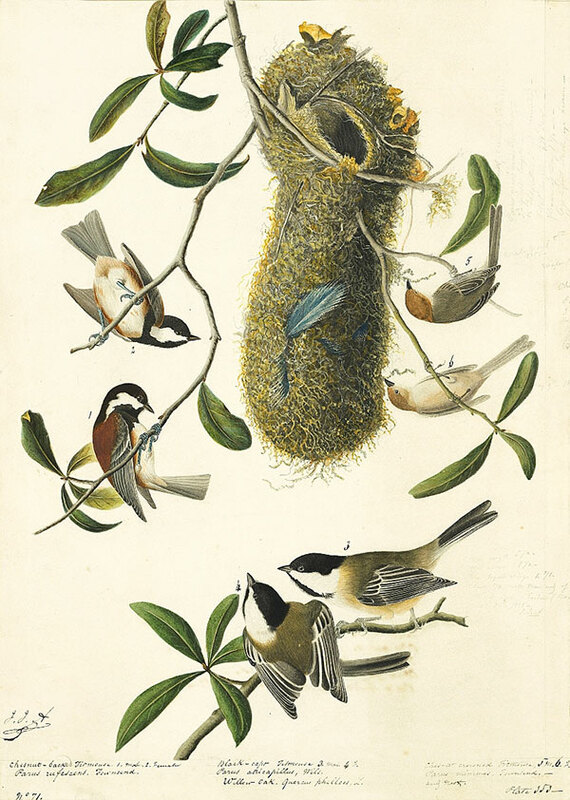 He only knew the Black-capped Chickadee (at the bottom) and obtained specimens of the two western species from the ornithologists Dr. John Kirk Townsend (1786–1859) and Thomas Nuttall (1809–1851), who had discovered them on the Wyeth Expedition to the Pacific northwest. They maneuver around the central, gourd-shaped hanging nest of the Bushtit (the pair at the right). This architectural marvel was provided by Nuttall, and Maria Martin, who painted the branches of the willow oak, probably assisted Audubon, who used scratching out in its execution.